Thread in 'Off Topic Discussion' started by MachineGod, Dec 27, 2018. I'm a new content creator looking to get my name out there, as well as hopefully help spread MWO a bit in order to garner more players, and more fans of the Mech Combat genre. I'm not a super great player and I don't talk a lot on streams... Mainly cus I have few viewers... BUT I am hoping to nab a couple more, as I'm doing a give away to help some players bring in the new year right! 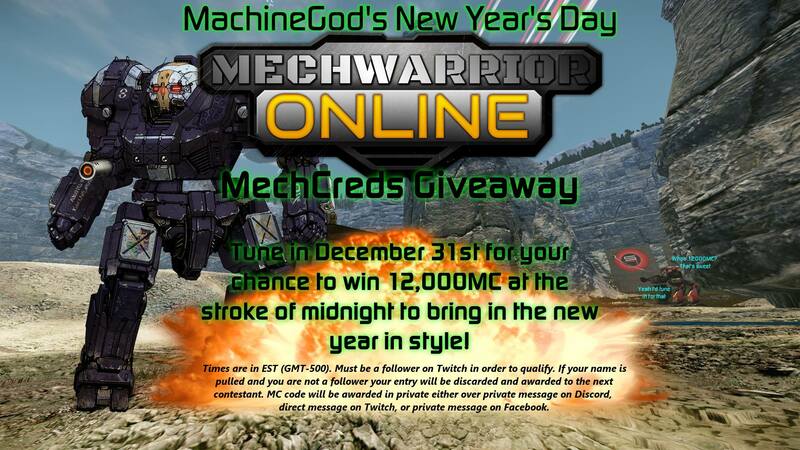 On December 31st, 2018 I will be giving away 12,000 MC at the stroke of midnight (12:00AM EST, -500 GMT). To qualify, you must follow me on my Twitch account, and of course, catch me while I'm LIVE in order to win. Hopefully I can get some of you guys to come watch me be bad at the game, and at the same time entertain you with it haha. Good luck, 'MechWarriors, and good hunting! Gun Tuv, Tollas669, Dagonus and 2 others like this.